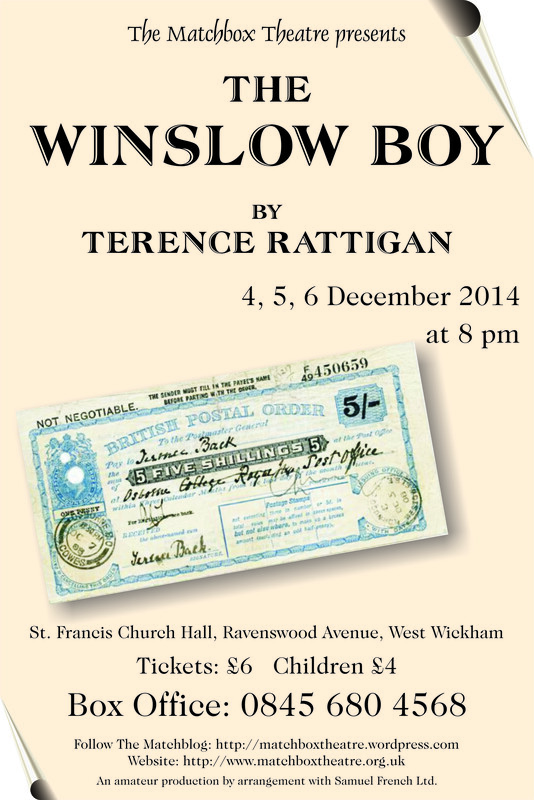 Tickets are now available for our December production, ‘The Winslow Boy’. Box The box office phone number is on the flyer attached and a pdf of the order form can be downloaded here: http://matchboxtheatre.org.uk/node/281 . Based on actual events at the turn of the 20th century, Terence Rattigan’s drama is not just about the legal battle fought by a father to clear his son’s name but also has at its heart questions about honour, right, justice, equality and the human condition. With a rich seam of warm comedy running throughout it’s a play that will provide an entertaining and thought provoking evening for audiences. Not for little reason is it seen as one of the theatrical canon across the globe and has been made into two highly successful films carrying its name. This is a show not to be missed and is going to be hugely popular so book early to ensure a seat. Further details from rehearsals will follow. Happy Tuesday.